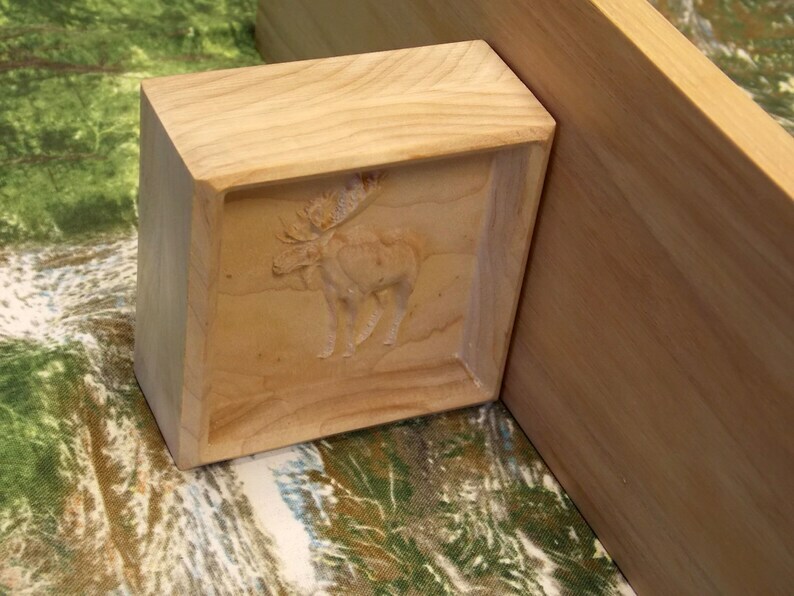 Floating Shelves: Imagine this 2-sided standing moose rustic cabin shelf bracket set with a 4" deep unfinished Floating Wood Shelf hanging in your bathroom, your den or at the cabin as part of your rustic wall decor! GORGEOUS Cabin Decor! Tired of metal art? Go RUSTIC with wood decor! Place your custom order today! Each wood corbel has a dual keyhole mounting hardware with screws. Custom orders allow you the freedom to pick your wood species and stain preference from the drop-down boxes to the left of the listing photo. The last photo is a chart to help you with the stain color on the different types of wood as a guideline. OUT OF STOCK items can be purchased by clicking on the BLUE Request a custom order link located under the photo listing. We are available to answer any questions you may have. Shelf Size: 18 x 4 x 1"
Corbel Size: 3 x 3 x 0.75"
Now, your shelf is ready to be decorated! During the checkout process, type in the "notes to TheWoodGrainGallery" your stain preference from the wood/stain chart in the photo section of this listing. In-stock orders will be shipped out in 1 business day and most custom orders will be shipped out in 7-10 business days.